Thank you to Audrey Straub and her amazing team of volunteers for another successful book fair! The kids get so excited and we love to see them excited about books! We also want to say thank you to Kristi Floriana and Liz Schollart for putting together another wonderful teacher conference dinner! Thanks to everyone who contributed to this! It is very much appreciated! We are so fortunate at Georgetown to have such great parents showing your support at conferences! It means a lot to the kids and to the teachers! It’s hard to believe we are nearing the end of the year already! For those of you traveling for Spring Break, we hope you are safe and have a great vacation! For those of you staying home, we hope for nice weather for you to enjoy! The first day off for Spring Break is Friday, March 29 and we return back to school on Monday, April 8! 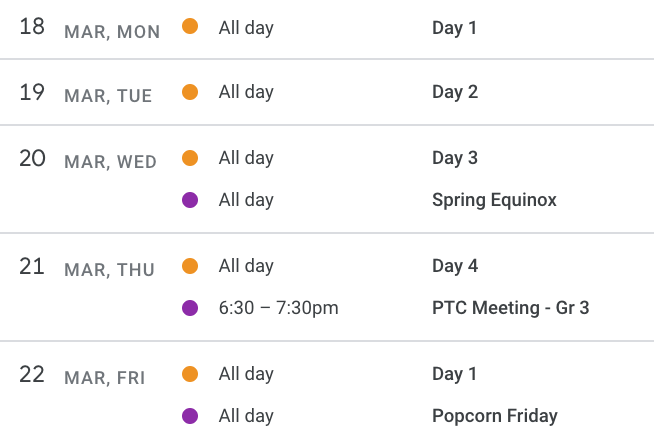 We jump right into the M-STEP when we get back and the schedule can be found just below. Rest up and we will see you after break! 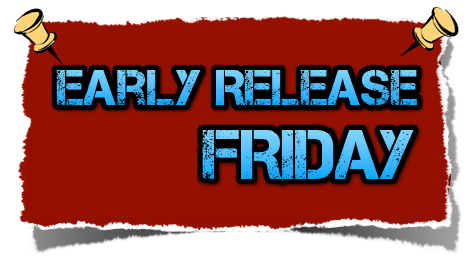 Our next early release is on Apr 12. We will be dismissing at 12:15 on Apr 12. If your child is a car rider, please be at school between 12:10 and 12:15 for pick up. Food Service will be offering a sack lunch on early release days. Children can order a lunch with their teacher in the morning and will have them to take to their destination. 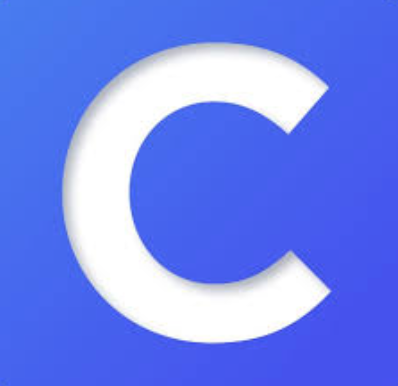 The cost will be $2.25. Free and reduced benefits will also apply. The M-STEP State testing for grades 3-5 will take place this spring. Please avoid all doctors appointments and vacation days on the dates that your child is scheduled to participate in the state wide M-STEP testing. Thank you for your attention to these dates. NOTE: If your child is ill, we will administer the tests on make-up dates. Do not send your child to school ill. We ask only that you avoid late arrivals, doctor appointments and vacation days on the dates listed below. Bring: 2 healthy snacks and a water bottle. Remind your child that all of our learning all year long has prepared us for these tests. This is our opportunity to show what we know! April 16-25 – M STEP testing dates, please avoid making appointments during this time. 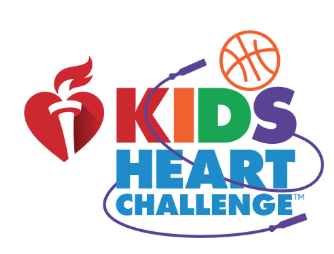 We’d like to celebrate student participation in the PE KIDS HEART CHALLENGE. As a school, we moved to online registration/payment. The purpose: Eliminate hundreds of dollars sent to school. Security of funds is my priority! We were thrilled with the results: $11,384 — breaking our all time record by $2000+. Thank you for supporting this service project — and our transition to online payment!!! 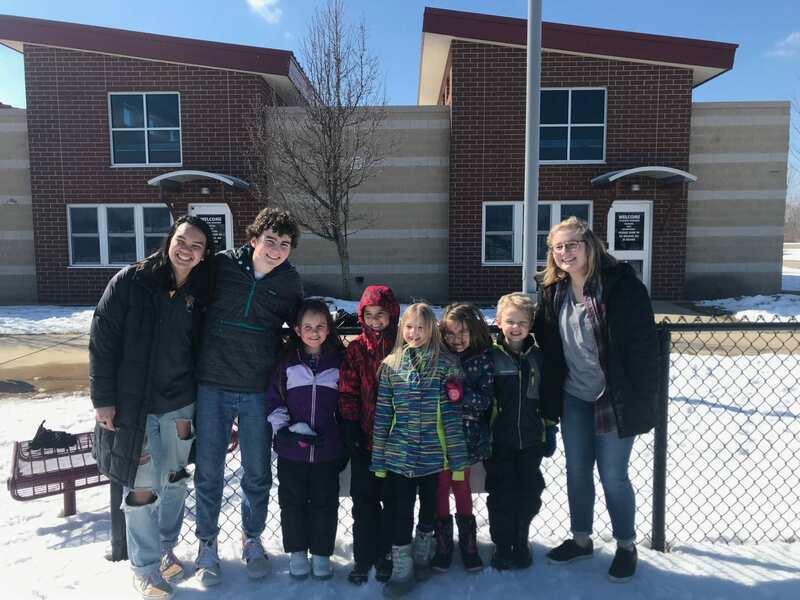 On May 7, Hudsonville School parents and community members will have the chance to vote on our annual Non-Homestead Millage renewal. This is an annual renewal request that voters have approved for the past 24 years and , if approved, would generate approximately $4.8 million dollars of operating revenue for our school district. Please note, this is not a tax on primary residences and is not a new tax. 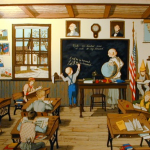 Shall the limitation on the amount of taxes which may be assessed against all property, except principal residence and other property exempted by law, in Hudsonville Public Schools, Ottawa and Allegan Counties, Michigan, be increased by 18 mills ($18.00 on each $1,000 of taxable valuation) for the year 2019, to provide funds for operating purposes: the estimate of the revenue the school district will collect if the millage is approved and levied in 2019 is approximately $4,850,000 (this is a renewal of millage that expired with the 2018 tax levy)? Kids up to 10 yrs old gather prize-filled eggs! 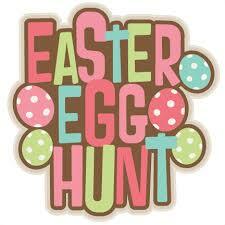 SEARCH FOR ONE OF THREE GRAND PRIZE EGGS! Voluntary donations are accepted. All proceeds will go to Helen DeVos Children’s Hospital. •The Hudsonville Athletic Boosters are presenting the GMB/ Eagle 5k ” Brian Carlson Memorial Run” on March 23, 2019 at 9am. The event will take place at Hudsonville High School with the route running through the city of Hudsonville. Each year, the Hudsonville Athletic Boosters seeks to supplement the athletics program with thousands of dollars through various fundraising activities, including the GMB Eagle 5K, whose proceeds will go to athletic scholarships. As an organization, we give ten $1000 scholarships a year to outstanding student-athletes who are pursuing a college education… Be sure to sign up on line at www.classicrace.com or visit our website www.hudsonville5k.com for more information and registration. Online registration only. Packet pickup and late registration will be at Harvest Health March 22 from 4-6pm and Race day morning from 7am to 8:50am. Be sure to check out and LIKE our Facebook page (GMB Eagle 5k race) also for all updates. All runners will receive lots of post-race refreshments. • You can click here to go to the community education page on the Hudsonville Public School website. There are many activities for your kids to look into! 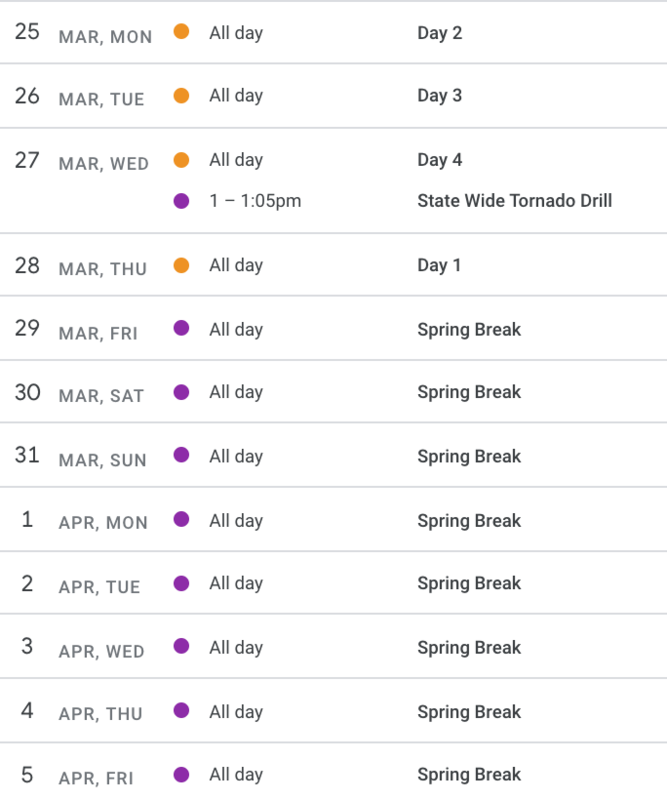 We have just four days remaining until our Spring Break. 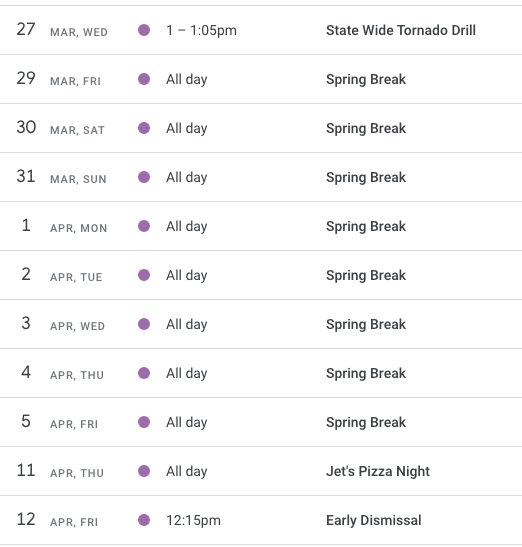 We will be busy with consistent routines because we know vacation excitement can translate into more impulsive behaviors in the classroom — but in particular in the hallway, classroom, playground and lunchroom. 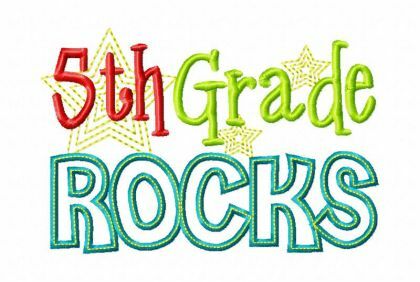 This is a great opportunity for me to provide a SHOUT OUT to our support staff (lunch team, recess team and classroom para pro team) who provide the necessary structure for the routines in our unstructured areas. These individuals are highly organized, always ready to listen and respond to student needs and consistent about the expectations about how to act responsibly in these areas. They are an ESSENTIAL part of our Georgetown family. I want to wish all of you a wonderful first week of April — no matter where you are during the spring vacation! Last Day To Sign Up For The Dance! Mark your calendars for the Georgetown Girls Dance! The cost is $25 per couple and $5 for each additional girl. You can make a check payable Georgetown PTC and return it with your completed form. Due to the illnesses going around, we are going to cancel our PTC meeting on Thursday, 3/21/19. This will be re-scheduled after spring break. New date will be posted on the blog. Norovirus: Comes on quickly – vomiting, diarrhea. 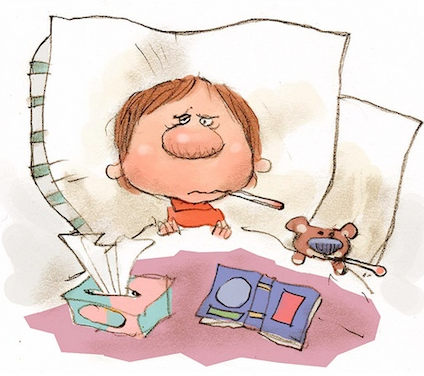 Children with fevers, vomiting, diarrhea must stay home until they are free of this symptoms for 24 hours. WHY? To prevent these viruses from spreading to other people at school. More and more we are hearing that students are being unkind to one another after school hours via various online chatting or social media platforms. When a student tells a teacher that someone in the class or school is making unkind comments, our first question is: Have you told you parents? If not, we tell them to do this as soon as they get home — and we also contact the parent to let them know they need to check in with their child. We want parents to be aware because kids make mistakes using social media, however harmful, hurtful words about another person or sharing inappropriate images is a red flag. When a student at school misuses a school device (sharing inappropriate images or sending unkind messages, etc. ), it is a violation of the acceptable use policy. Every student and parent signs this at enrollment. If this is violate, we have the right to deny the student access to the device. 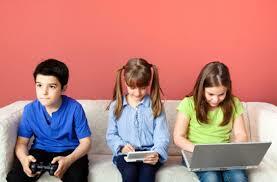 Here is the link to an excellent article about parenting tips for kids and social media. Is this IN, OUT, BOTH? This spring, we are teaching our students (K-5) the difference between TATTLING and TELLING. 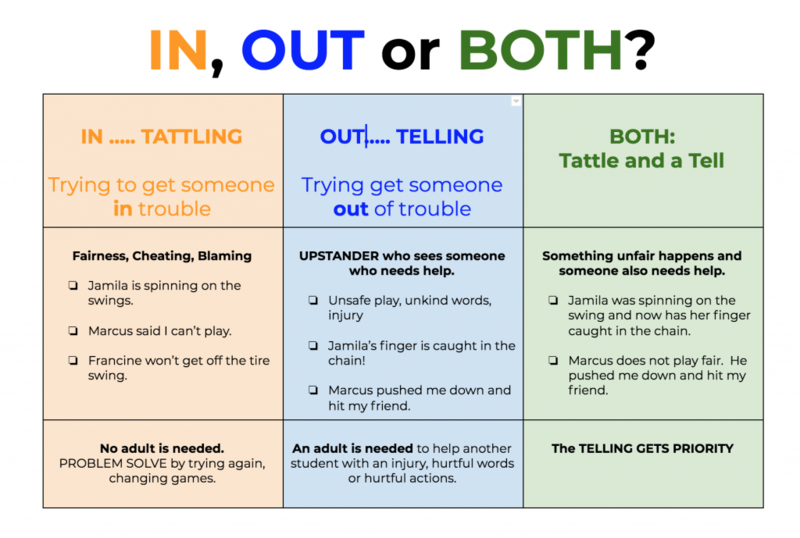 We are using a simple question, “Is it IN, OUT or BOTH?” This question is designed to help students determine if they are tattling or telling. We want to be told the telling…. NOT THE TATTLING. Spring brings renewed skills in tattling … which in turn creates a great deal of drama on the playground. We also want to encourage all of students to TELL if they see something happening that is not safe. See the image below for background on the differences between the two. We had a very VERY successful parent teacher conference week with 96% of our parents participating in a dialogue about their child’s social/emotional and academic learning. Your perspective and input about your child’s growth is critical to helping us support your child. We’d also like to celebrate student participation in the PE KIDS HEART CHALLENGE. As a school, we moved to online registration/payment. The purpose: Eliminate hundreds of dollars sent to school. Security of funds is my priority! We were thrilled with the results: $11,384 — breaking our all time record by $2000+. Thank you for supporting this service project — and our transition to online payment. Another high participation event: BAM BOYS DAY OUT. A shout out to the PTC team for organizing and hosting this event! On a final note, we completed our final LOCKDOWN DRILL this week. We had 60 + parent volunteers/visitors in the building at the time of the drill — which allowed them to experience how we run the drills and what the students/teachers do to get into a safe space. As we look ahead to next week, the weather forecast makes my heart happy: 8 days of dry weather conditions. This means outside recess — and sunshine! Have a wonderful weekend…and here’s to next week! Mark you calendars for the Georgetown Girls Dance! Photo above: Lydia, Oliver, Kenzie, Brody, Georgie, Kaylee, Colin and Abbie Note: Lydia, Oliver and Abbie are the TARGET CREATORS! Every year, students have to learn how to write persuasive letters. It’s really hard to write persuasive letters…and it takes LOTS of practice. 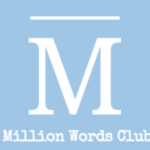 Keep writing…because sometimes the letter works…and someone is persuaded to help solve your problem. Watch this video to learn how a first grader got snowball targets for our playgrounds.